Fyre Fest in the Bahamas. 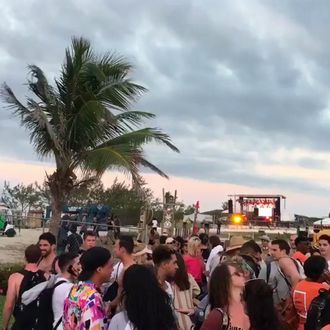 In a now-deleted tweet saved by BuzzFeed, the Bahamas Ministry of Tourism issued a statement saying festival staff “did not have the capacity to execute an event of this scale.” Vulture has reached out to Ja Rule and the event’s organizers and will update when we hear back. Update 2:38 p.m. For all those wondering where Ja is, he’s finally released a short statement on Twitter. For the record, he says, Fyre Fest was “NOT A SCAM” and it is “NOT [HIS] FAULT,” but he’s working to get everyone off the island and out of this real-life Hunger Games shortly.